So I decided to make myself a tradition Nordic cake for the day. 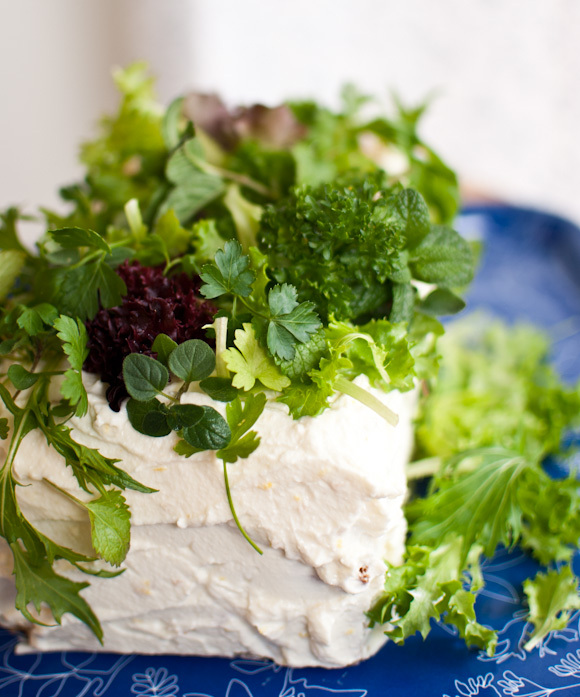 Voileipäkakku or smörgåstårta (literally sandwich cake) is often served at Christenings, birthdays and pretty much at any celebrations across the Nordic countries. The cake can be layered with a variety of savoury fillings, but I've made it vegetarian and introduced some new flavours in the way of sun-dried tomatoes and tzatziki. I've kept the traditionally heavy cake (which uses mayonnaise and cream in the filling) light by using wholemeal bread, Greek yoghurt and light ricotta. There are a few steps in preparing this cake, but I think it makes it all the more satisfying and special. * you need to start this recipe at least one day ahead. 1. Start by draining the yoghurt and grating and draining the cucumber. 2. 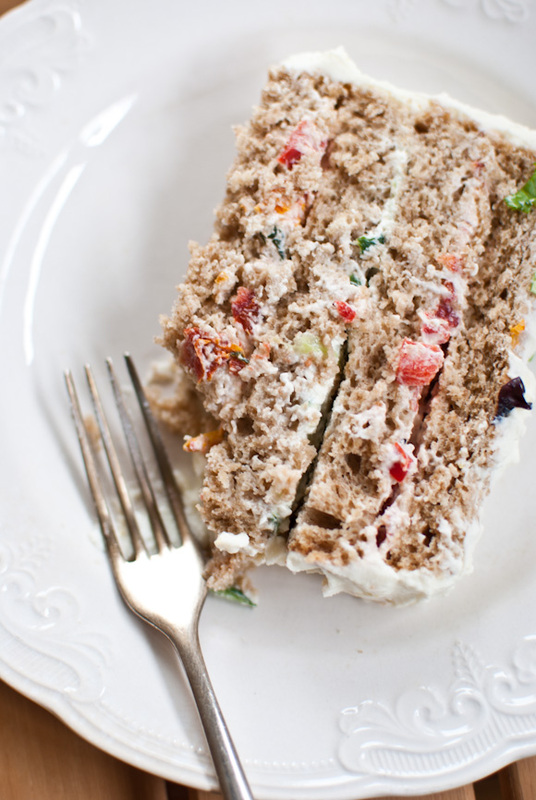 There will be two different fillings to this cake. For the first filling, mix half of the drained yoghurt with finely diced capsicum and chopped semi-dried tomatoes. Season the mixture with freshly ground black pepper and set aside. 3. For the second filling, mix the rest of the drained yoghurt with grated and drained cucumber and grated garlic. Season the mixture with a small dash of white wine vinegar, freshly ground black pepper and a small pinch of salt. Set aside. 4. Cut the loaf lengthwise into 4 layers. Cut the crusts out. Place the first layer on a large flat dish and brush the layer with lemon juice-water mixture (about 1/4 part lemon juice to 3/4 parts water). Alternatively you can use vegetable stock or milk for this. 5. Spread half of the tomato-capsicum filling evenly on the first layer. Place a second layer of bread on top and brush it with lemon-water. 6. Spread half of the tzatziki mixture on the second layer and top again with bread. Brush with lemon-water. Continue with third and forth layers leaving the final piece of bread (crusts removed) on top. Brush that too with lemon-water. 7. Cover the cake with cling wrap. Place a tray and a small weight on top of the cake and refrigerate over-night. 8. 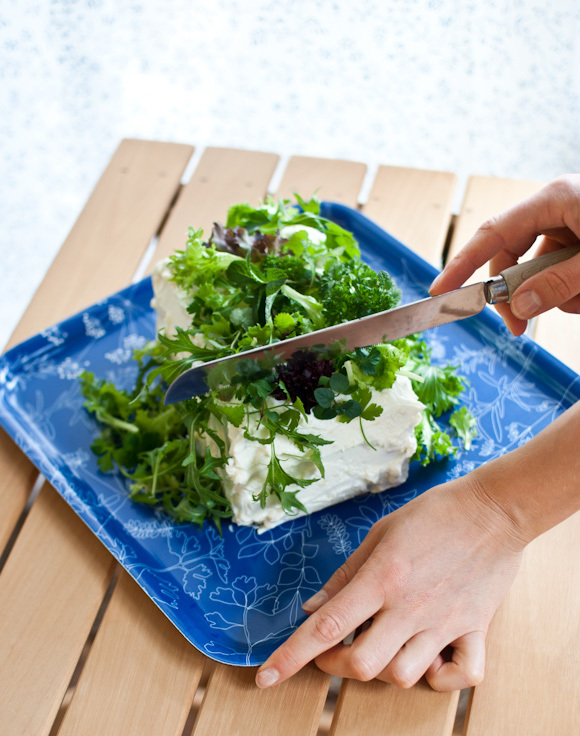 The next day, remove the cling wrap, spread lemon flavoured ricotta evenly on top of the cake and decorate it with fresh herbs, cherry tomatoes, cucumber slices, etc. Slice up and enjoy! 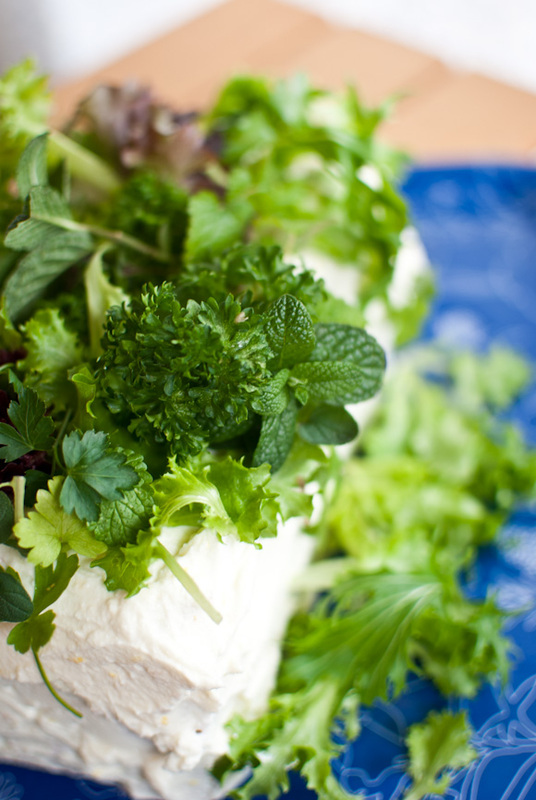 Instead of ricotta you could use cream cheese, soft goat cheese, even mascarpone would probably work. 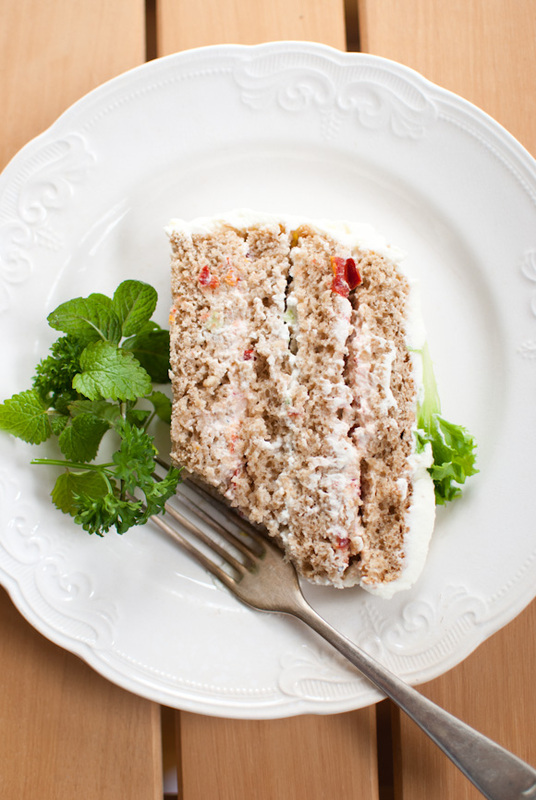 Just remember to keep it savoury, that's the whole point of this cake! You could use traditional mixture of mayonnaise and cream with the filling of your choice. You could also make this using shop-bought bread (of course), but I think it's much more satisfying to make completely from scratch. Happy B'day maria...enjoy the "dirty thirties"! Love this cake! Paljon Onnea Maria! I'm making a sandwich cake next week for a meeting and it's going to be vegetarian as well :) Have a great birthday!! Happy birthday! Your Nordic cake looks great, but I'm glad to hear you are also having a sweet treat for your birthday. Happy Birthday Maria. A very healthy and delicious cake. Love it. Absolutely beautiful...those herbs on top made my jaw drop. It is so interesting to see a savory cake like this. thanks again for an amazing trip to Mosman last week - i thoroughly enjoyed meeting you! Happy Birthday Maria..hope you enjoy your day..this is an unusual cake but really pretty & healthy too! And the cake looks lovely, and sounds pretty unique too. Happy Birthday, Maria! Have a wonderful day. That cake looks so fresh and delicious! A perfect picnic item. The sandwich cake looks very delicious. Hope you have a wonderful year ahead - 30 is a good age to be! Happy Birthday my darling. I did nothing over the top for my recent 40th other than a quiet dinner with friends. Pretty cake! Happy 30th birthday! How exciting! Many say life begins at 30 so here's to many fabulous years ahead. P.S. Love that you prefer to do something more lo-key - much more my style, too! :) Have a lovely celebration. Wow! Happy birthday, and enjoy all those changes and opportunities that lay ahead for you. I turned 30 myself while living in Finland (in Turku, exactly) and I know so well how you celebrate there those round numbers. I loved this cake and now I know how to prepare it in a lighter way. Thanks for that and all the best for your new year. Happy birthday! Welcome to the 30s club! Happy birthday! I'm turning 31 at the end of the month and I have to say that 30 was one of the best years of mu life. Hope yours is equally fantastic!!! Happy Birthday! We share the autumn baby and the sign of virgo. Mine is Sept. 22nd. Last time I celebrated it in Sydney was a few years ago at a great Greek place in Leichhardt called Nostos. Amazing place. Best of luck on the house and your work this year! Happy Birthday! Oh to be 30 again. I was having first baby at 30. How time flies. I hope you had a great day. The cake looks sensational! Happy birthday Maria!!!!!! I hope you have a wonderful birthday. Love this cake, it looks fantastic! Happy Birthday Maria! I wish you all the best and let me assure you, entering your 30s is a blast! Oh happy happy birthday my friend! I hope you have an amazing day and weekend and that cake looks divine. It is a shame though your making your own treat:) If I were there I would whip up something for ya! Wow that cakes looks lovely. And 30 is not old (I am 34 this year). Just think that when you are 80, you will look back at being 30 and think you were in the prime of your youth! I found your blog from Not Just Apples and I love it - I have never eaten anything Scandinavian, so look forward to trying some new dishes. happy birthday!!! oh a savory cake, really? that's so cool, I have never heard of anything like that! Very interesting. Happy birthday, Maria! I hope year 30 bring everything you hope for and more. I've never seen a cake with those ingredients—I'm intrigued! Happy Birthday! We love that cake - it reminds me of big celebrations in Sweden with Mats' family. I have had plenty of seafood versions in the past but never a veggie one - so it's a recipe to bookmark. Can't wait to see the sweet treat! Happy Birthday! Wishing you all the best. No reason to worry about the 30s. I think they are cool (and much less nerve-wracking). Happy Birthday Maria!! Wishing you all the best in your first year of the 30s. May all your dreams and plans come true! I actually like the sound of this age. I'll join the club in just a couple of days, and I think I will make myself this cake. It's very original and sounds super yummy. A very happy birthday to you! I am intrigued by this cake and love the ingredients. Enjoy your weekend celebrating! Happy birthday! May you have a hundred more happy years filled with food, with the ones you love. Happy birthday Maria! I know 30 for me marked a number of changes as well - older and wiser. Enjoy! Palju, palju õnne sünnipäevaks - Sa elagu, Sa elagu, Sa elagu :) ! This may be a funny thing to say: I found my 30th the hardest, the 40th heaps more fun and the 50th a joyous, happy lark!! Thank you for a wonderful column and have a very happy day! [Looking at the Finnish congratulations, I believe you can u'stand mine!]. You've reminded me/inspired me to make sure I make the most of my last year in my 20's! What a lovely idea for a way to celebrate your birthday - I am seriously loving that it leaves the way clear for a sweet cake as well. Two birthday cakes = bliss. happy birthday and welcome to the 30's club! hope u have an awesome weekend and what a lovely cake! Happy Birthday! Many happy returns :) Your cake is certainly intruiging, I really like the idea of a savoury cake. Happy birthday Maria! Hope all your wishes will come true and this year turns out to be the best one yet. :-) Love your beautiful Nordic cake. I am late! I remembered your birthday ages ago, but life has been busy, sorry. Hope you had a lovely day. Your 30s are a great time. I will be saying goodbye to them soon myself (kicking and screaming, of course!). They've been a rollercoaster, but loved every minute of it. LOL! Good luck with all your milestones ahead! Happy Birthday Maria! Hope you had a fantastic day! Happy Birthday! Everybody knows that savoury cakes are much better anyway! I agree that I prefer more low-key celebrations at home... I wonder if most food bloggers figure they can cook better food at home? ;) Although, it is nice not to cook sometimes, too. Happy Belated Birthday, Maria! Sorry to just see this now. Hope your birthday was fabulous + best wishes for the year to come. I made this today. It was really neat. I used alternate fillings (pimento cheese and olive tapenade), but it was super tasty! Oh my soul! Just found this on a Pinterest board and I love it. Will have to make it soon. This can also be perfect for kids birthday parties to make them aware that birthday cake do not always have to be full of sugar and overly sweet. With your permission I will share this recipe on my site soon.